Which Home Firefighting® products are right for me ? Home Firefighting® equipment is the same equipment used by fire departments throughout the United States and worldwide. After extensive testing, we have selected to include as part of our Home Firefighting® product line those products which best provide homeowners with the added ability to pre-treat their their home/property and, if needed, fight a fire directly, while balancing price with performance. Our #1 suggestion when choosing a fire protection system is "ASK TO SEE A PUMP PERFORMANCE CURVE". We provide pump performance curves on all our pumps. A pump curve clearly shows how your pump will perform under actual firefighting conditions (See our pump narrative below). At a minimum, adding a 3/4" GHT Home Firefighting® Garden Hose Foam Kit to each of your existing garden hoses will make your standard water supply 3-5 times more effective for fire suppression than plain water alone. These kits can create fire breaks, coat walls or roofs and put out small fires quickly and easily. Larger foam kits can be attached to the hose end of a pump system to provide even larger amounts of foam which can be used to pre-treat your roof, walls, deck, trees, shrubs and other flammable areas around your home as well as for fighting larger fires with a limited water supply. Gel can be applied to all exterior structural surfaces including metal, glass, stucco and wood, creating a long lasting thermal barrier. When applied to vegetation, Barricade® gel can increase the defensible zone exposed to wildfire and will not damage plant life with the exception of possible leaf drop. The ultimate setup involves the installation of a Stationary Pump System which consists of a permanent water supply connected to a stationary Home Firefighting® brand Fire Pump and one or more hydrants placed around your home & property to provide multiple hookups in the event of a fire. These systems are designed to meet the specific needs of your property and require installation & maintenance by an experienced do-it-yourself homeowner or a licensed contractor. How big a water supply do you have? What family members will use the system? Can your family members operate the system, hose and nozzles you have selected? Will the equipment be compatible with your local fire departments equipment? What makes our pumps better than other pumps ? Our Home Firefighting® Fire Pumps are designed to produce the flow and pressure required for real firefighting. While other large diameter outlet water pumps are designed to produce high flow rates at low pressure, our pumps produce both high flow and high pressure. While flow is important in delivering a large quantity of water, without adequate pressure, a fire pump is of little use since it cannot deliver that water very far. Flow is the volume of water leaving the pump over a given period of time and is usually measured in GPM (Gallons Per Minute). Don't be fooled by pumps with high GPH values (Gallons Per Hour) as you must divide that number by 60 to get actual GPM. Flow is important to know and control as it determines how fast you will use up your water supply. Pressure is the force at which the water leaves the pump in PSI (Pounds per Square Inch). For each pound of pressure, water can be raised 2.31 ft in a vertical pipe. Pressure is important as it controls how far the water can be pushed, both vertically and horizontally. With any pump, as Flow increases, Pressure decreases. Therefore, in order to properly evaluate a pumps performance for firefighting you need to know its Pressure rating at the rates of Flow you will be using when firefighting. Most pumps advertise their maximum PSI and maximum GPM. This can be deceiving since maximum PSI is achieved at zero GPM ("no-flow" or "static" conditions), while the maximum GPM is achieved at minimum PSI (close to zero pressure). Remember, what really matters is how many PSI the pump can produce at your GPM requirement! 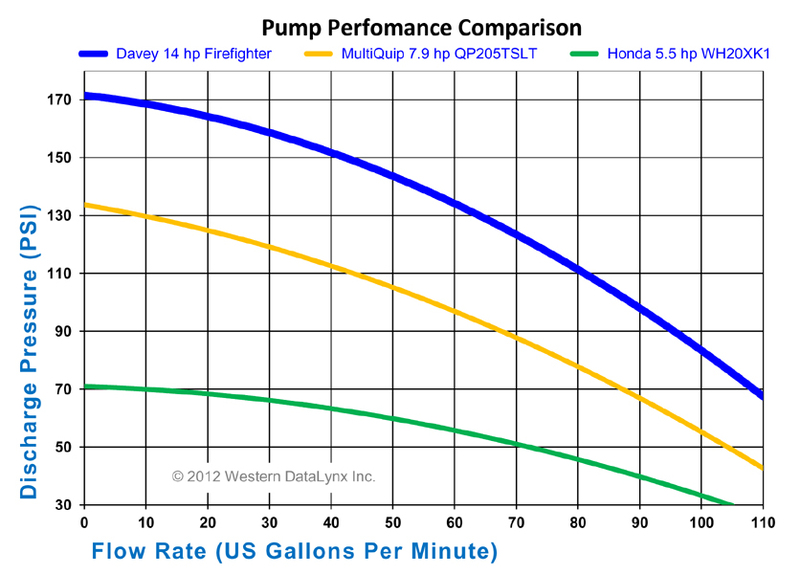 To determine the suitability of any pump look at it's pump curve (see our Firefighter® pump curves in the chart below). By following the curve to a specific flow rate you will be able to determine the pumps output pressure at that flow rate. Common firefighting equipment flow rates are 15-30 GPM for 1" hose and 30-60 GPM for 1.5" hose. So logically, you want to a pump that can produce the greatest Pressure at these Flow rates, to provide you with the greatest possible reach. FACT: While larger municipal fire engine mounted pumps can deliver from 90-300 GPM, those flow rates are unnecessary for homeowners and usually end up wasting a large amount of water. They also make the hose much harder to handle & control. Our Home Firefighting® Fire Pump offers greater Pressure than other pumps at these typical firefighting Flow rates. The pump heads used on our pumps have been proven effective through years of use in the Australian Outback and are currently being used in homes & ranches throughout the U.S. as well as by government and private forestry firefighting vehicles worldwide. What type of fire hose should I use? Single jacketed, forestry fire hose is more maneuverable, lighter in weight and more economical than double jacketed fire hose. That's why many fire agencies including USFS, CDF and others use single jacket forestry hose for both structure and wildland protection. While some people may try to sell you double jacketed fire hose, there is no reason for the average homeowner to use it. Today's single jacket forestry hoses are lightweight extremely durable, kink resistant and can easily provide the flows needed to operate most fire equipment including foam and gel eduction systems. THESE ARE NOT THROW AWAY HOSES ! Our Home Firefighting® fire hose is manufactured for us by Key Hose (The largest manufacturer of fire hose in the US.) to NFPA, USDA and/or UL/ULC standards using state-of-the-art weaving processes to produce a rugged and durable hose product to meet the needs of firefighters! Our added coatings make them as durable as many heavier rubber lined and double jacket hoses that weigh twice as much. What size fire hose should I use ? The size of hose to use depends upon your particular situation and who will be using it. While 1.5" hose can flow a greater volume of water than a 1" hose, it comes at a cost. A 1.5" line is very difficult for most people to hold onto for any length of time. 1.5" hose is also THREE TIMES as heavy as 1" hose making it harder to move around your property! 1" hose provides the best compromise between volume and manageability. 1" hose can deliver enough flow for most applications and is much easier for the average person to hold and move, especially for a long period of time. After all, what good is a fire hose if you can't handle it? FACT: While 1.5" hose is a primary hose for municipal fire departments, Forestry trucks often use 1" line for fighting fires since it is more maneuverable under extreme wildfire conditions. Also, if you look carefully at scenes of municipal firefighters in action you will see there are usually 2-3 firefighters manning each 1.5" line due to the weight of the hose and backpressure from the nozzle. Our 9hp Home Firefighting® Fire Pumps can easily drive two 1" lines simultaneously, providing greater simultaneous coverage than a single 1.5" line. Where long hose lays are required, a 1.5" hose can provide reduced friction loss before a transition to 1" hose for end of line manueverability. 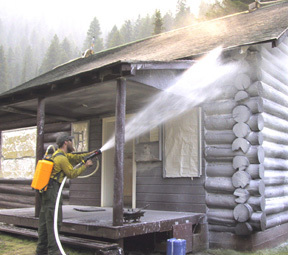 3/4" hose is effective for mop-up and smaller maintenance jobs like using a foam kit to paint a house with foam or create a firebreak in grasslands around your home. It can be handled by pretty much anyone with ease. Don't be fooled by it's size though, this is not just another garden hose! It is designed to operate at pressures far above those produced by your normal faucet. Our consumer research with both firefighters and non-firefighters has shown an overwhelming preference for the maneuverability of a 1" fire hose by the average person. However, since everyone has a preference, we offer our systems with either 1" or 1.5" hose. In addition 2.5", 2", 1.5" and 3/4" hoses and adaptors can be ordered separately. How much hose should I have on hand ? Ideally, you should have enough hose to reach all parts of your house/property to be protected. Our Home Firefighting® Fire Pump can feed hose runs in excess of 1000+ feet so the only real limit is your budget and your imagination. In some instances you might want to have multiple lines running so two or more people can protect different parts of the house simultaneously and you aren't constantly dragging the hose back and forth. If that is the case, remember to order an extra nozzle and valve for each hose. Friction loss is an important factor to consider when running long lengths of hose. As flow increases through a hose or pipe, so does friction loss (a decrease in pressure). When flowing 30gpm, a 1" fire hose will loose 15 PSI through a 50' length of hose. This is rather insignificant when using our high pressure (150+ psi pumps) but is of great significance if using a cheaper "trash" pump based system. So if you are need long hose runs we recommend using 1.5" for the hose lay to reduce friction loss, reduced to 1" at the operating end for easy of use by the operator. What is CLASS-A foam and what is a foam kit? Foam additives break down the waters surface tension, thereby increasing waters penetration into porous materials and slowing down it's evaporation rate. This creates a longer lasting and better insulating fire barrier. Adding a CLASS-A foamant actually increases waters effectiveness up to 500 percent ! A foam kit is used to add a foamant to the water. Class-A foamant is used for cellulose based fires such as wood, paper and other porous materials plus tires and other rubber compounds. It is NOT intended for use on hydrocarbon (gasoline) based fires where an AFFF foam would be used instead. While there are many ways of adding foam, we prefer using a post pump eductor along with an aspirating nozzle at the end of the hose. Our end-of-line foaming kits utilize a solid foam cartridge or 1.5 gallon jug which can be easily replaced and adds little weight to the end of the line. The built-in eductor mixes the foamant at a 1% solution, the standard solution for most Class A foam applications. FACT: Foam eduction kits are designed to operate at 100 PSI nozzle pressure AT THEIR RATED FLOW IN GPM. Note: At a 1% eduction rate, 1 gallon of CLASS-A foam will treat approximately 100 gallons of water and increase it's effectiveness 3-5 times while covering approximately 4000 square feet.